I hope everyone had a very Merry Christmas! I know we sure did despite not being able to go to AR and be with family. There are too many pictures to try and comment on each one and I honestly don't feel like giving a detailed account of everything that went on yesterday morning so I will just let the pictures speak for themselves. Ok I have to add this story about Andrew on Christmas morning. All he ever asked for was a Nerf gun so needless to say he was VERY excited when he opened this present. A little later in the morning Andrew was playing with the gun shooting at random things in the living room. Adam and I weren't paying much attention until he hear him say "I'm just gonna point this at my face, shoot it, and dodge the bullet". Really?!?! Before either of us could say anything the kid did exactly what he said he was going to do. Only he didn't dodge the bullet. Yep, that's right, my son shot himself in the eye with a foam Nerf dart :-) Being the good parents we are, Adam and I laughed uncontrollably for a good 5 minutes. Once we calmed down and Andrew stopped crying (lets face it you know it stung a little) we took that moment to explain that this was the reason you don't point guns at people's faces, real or fake. Above: One of Adam's favorite Christmas movies is National Lampoons Christmas Vacation. I got him one of the moose head eggnog cups from that movie. For the 1st time in 12 years I was finally able to surprise him with a gift. Below: Adam got a snuggie too courtesy of my parents. Actually we all got one. Ava has a pink cammo one and I got a Razorback one, but I don't have a picture of us wearing ours. Christmas Eve we let the kids pick one present each to open. I kind of laughed when I saw the gift Andrew chose because I knew what was in it and I was afraid he would be disappointed. Boy was I wrong about that. I have never seen a kid so excited over getting a pair of slippers! They haven't left his feet ever since he opened the package. Ava's reaction to her present was much much different. She opened her new bath toy which was a boat that plays music, motors around the tub and has a sprinkler that shoots water out of the front. She loved this toy while we were in the living room. She danced to the music and laughed constantly. However, when we put her in the tub with it, Ava's feelings changed. She screamed like someone was trying to kill her as soon as it started coming towards her and shooting out the water. It was hysterical! Adam had to sit next to the tub and keep the boat as far away from her as possible in order to keep her from screaming. Sadly I was too busy laughing to think to get the camera. I will try and get some pictures and video the next time we decide to put it in the tub with her. After both kids were all bathed they got to put on their new Christmas PJs. Ava had Dora the Explorer and Andrew had How to Train Your Dragon. This year we finally got around to letting Andrew decorate a Gingerbread house. I have had the intentions of letting him do this in the past but for one reason or another we've never done it. So on Christmas Eve we broke out the kit, I mixed the icing and the two of us sat down to decorate. I opted to do the icing and Andrew put on all of the candies. He had a lot of fun deciding what color went where and telling me what he wanted on each side (windows, doors, etc). All in all I don't think we did a terrible job, especially for our first attempt. I am hoping to make this a tradition and in a few years Andrew and Ava can decorate together. This year I forgot to buy everything we needed to make sugar cookies so instead I picked up some slice and bake ones from Wal Mart. I also got a bag of green cookie icing so Andrew could decorate the cookies once they were cool. He did ask me to do a few of them (mainly the ones with writing). I didn't get a picture of the actual decorating process, but here is one of the finished products. This picture really says it all don't you think? The Wednesday before Christmas Adam and I took the kids to the mall to see Santa. 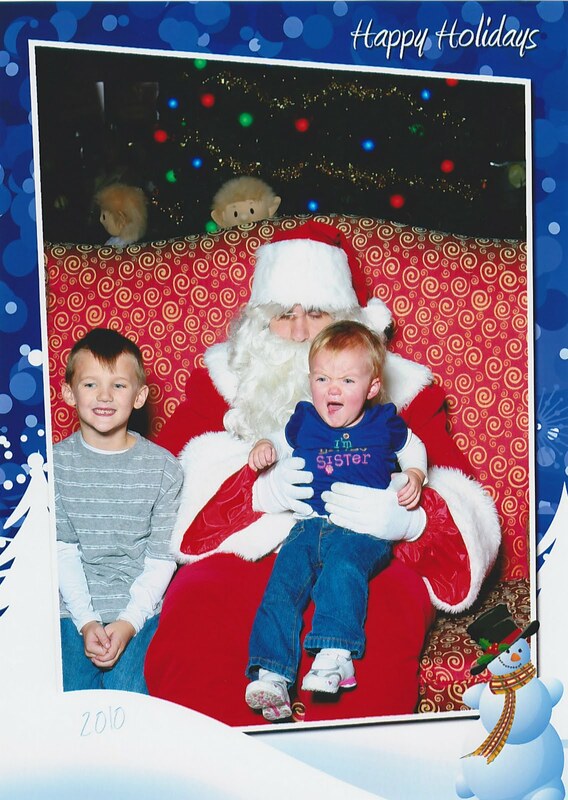 Andrew went straight up there and started talking Santa's ear off about everything he wanted. I had a feeling Ava was not going to like Santa so we waited a few minutes to let Andrew finish before sitting her on Santa's lap. It took her all of about 10 seconds to freak clean out once we put her down. I do love how this picture came out though. It's such a classic picture. 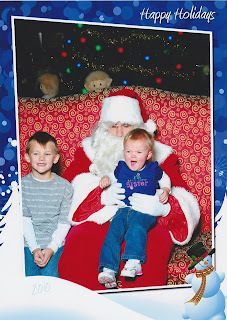 After visiting Santa we went to Topeka to drive through their Winter Wonderland. It was a great little setup of lights and you could even buy 3-D glasses to look at the lights. Andrew of course loved every part of it. Adam and I weren't quite as impressed but I think that's because we are older. Of course before we went to see the lights we had to get dinner. We ate at Red Lobster (one of Andrew's favorite restaurants) for the first time in a long time and it was so good. Ava even started feeding herself with a fork there. We had to put the food on it for her but then she picked it up and put the fork in her mouth. I took a picture with my phone but I haven't figured out how to get it onto my computer yet. Maybe I'll figure that out one of these days. On December 10 Adam and I went to the IACH (Irwin Army Community Hospital) Annual Holiday Ball. This was the first military ball we've been able to attend in 5 years so I was excited to get all girled up for a change and go. We had a really good time and met some new people we are becoming friends with. Above: At home before we left for the ball. The first a second graders at Andrew's school had their Christmas concert on Dec 9. They sang about 8 song and did a really good job. Sadly I didn't get very many pictures primarily because people in front of me kept getting their heads in my way. Maybe at the next concert we'll get their earlier and find some closer seats.